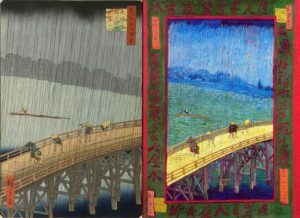 The art piece titled Bridge in the Rain by Van Gogh (top image) is a visible reminder of the impact of Japanese ukiyo-e on the soul of this esteemed Dutch artist. 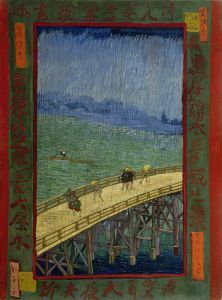 Indeed, the passion of this extremely adorable art piece by Van Gogh weaves naturally within the original by Hiroshige. This reality is abundantly clear despite major differences in relation to color schemes, texture, the power of nature, and other important factors. 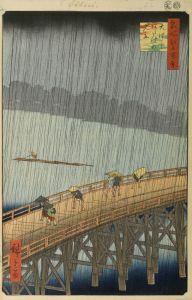 Visibly, the original by Hiroshige is titled Sudden Shower Over Shin-Ohashi Bridge and Atake appears more tranquil. Yes, it is clear that in both respective art pieces the weather is extremely negative based on rain and a swirling wind. However, despite this, the art produced by Hiroshige is gentler because of the color scheme of the backdrop and landscape. 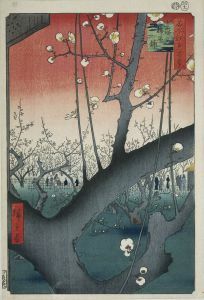 Therefore, just like Buddhism and Shintoism became to share a similar space within the land of the rising sun, irrespective if certain historical periods favored one faith over the other, it could equally be said that the fusion of nature and humans is interacting more in tandem despite the harsh weather conditions in the art piece by Hiroshige. 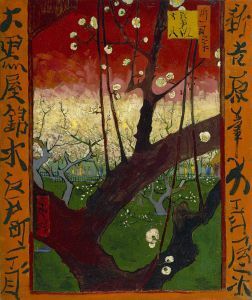 Some Japanese art and cultural articles are republished based on the need to inform our growing international readership about the unique reality of aspects of Japanese art and culture.